Aren you looking for good Quality Current Affairs Magazine? Then here is the best place for you. We know you prepared for all India Government Job. Current Affairs is the most important subject for any kind of Government Job Exam like, wbcs, ssc, upsc, rrb, bank, police, etc. So you need some good quality materials to practice. We, Solve this problem. 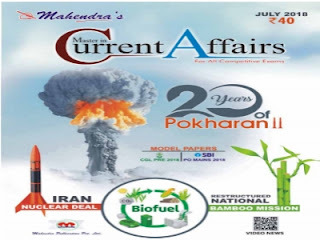 Here, you can get some good quality Current Affairs magazine for Competitive Exam. Today GK Solve share Mahendra's Current Affairs magazine July 2018 full PDF Download link. Details of Magazine and download link are given below. Candidates are requested to download this pdf book as soon as possible and start practice. Hope, this post is very very useful to you.